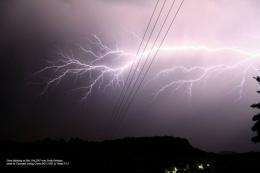 (PhysOrg.com) -- Every year, scientists learn something new about the inner workings of lightning. With satellites, they have discovered that more than 1.2 billion lightning flashes occur around the world every year. (Rwanda has the most flashes per square kilometer, while flashes are rare in polar regions.) Laboratory and field experiments have revealed that the core of some lightning bolts reaches 30,000 Kelvin (53,540 ºF), a temperature hot enough to instantly melt sand and break oxygen and nitrogen molecules into individual atoms. And then there is this: each of those billion lightning flashes produces a puff of nitrogen oxide gas (NOx) that reacts with sunlight and other gases in the atmosphere to produce ozone. Near Earth’s surface, ozone can harm human and plant health; higher in the atmosphere, it is a potent greenhouse gas; and in the stratosphere, its blocks cancer-causing ultraviolet radiation. In 1827, the German chemist Justin von Liebig first observed that lightning produced NOx -- scientific shorthand for a gaseous mixture of nitrogen and oxygen that includes nitric oxide (NO) and nitrogen dioxide (NO2). Nearly two centuries later, the topic continues to attract the attention of scientists. Fossil fuel combustion, microbes in the soil, lightning, and forest fires all produce NOx. Scientists think lightning's contribution to Earth's NOx budget—probably about 10 percent—is relatively small compared to fossil fuel emissions. Yet they haven't been sure whether global estimates of NOx produced by lightning are accurate. "There's still a lot of uncertainty about how much NOx lightning produces," said Kenneth Pickering, an atmospheric scientist who studies lightning at NASA's Goddard Space Flight Center in Greenbelt, Md. "Indeed, even recent published estimates of lightning's global NOx production still vary by as much as a factor of four. We're trying to narrow that uncertainty in order to improve the accuracy of both global climate models and regional air quality models." Using data gleaned from aircraft observations and satellites, Pickering and Goddard colleague Lesley Ott recently took steps toward a better global estimate of lightning-produced NOx and found that lightning may have a considerably stronger impact on the climate in the mid-latitudes and subtropics—and less on surface air quality—than previously thought. According to a new paper by Ott and Pickering in the Journal of Geophysical Research, each flash of lightning on average in the several mid-latitude and subtropical thunderstorms studied turned 7 kilograms (15.4 pounds) of nitrogen into chemically reactive NOx. "In other words, you could drive a new car across the United States more than 50 times and still produce less than half as much NOx as an average lightning flash," Ott estimated. The results were published July. When the researchers multiplied the number of lightning strokes worldwide by 7 kilograms, they found that the total amount of NOx produced by lightning per year is 8.6 terragrams, or 8.6 million metric tons. "That's somewhat high compared to previous estimates," said Pickering. More remarkable than the number, however, is where the NOx is produced. A decade ago, many researchers believed cloud-to-ground lightning produced far more NOx per flash than intracloud lightning, which occurs within a cloud and far higher in the atmosphere. The new evidence suggests that the two types of lightning produce approximately the same amount of NOx per flash on average. But since most lightning is intracloud, this suggests a great deal more NOx is produced and remains higher in the atmosphere. 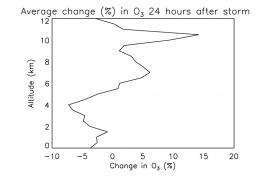 Compounding this effect, the research also shows that strong updrafts within thunderstorms help transfer lower level NOx to higher altitudes in the atmosphere. "We've really started to question some of our old assumptions as we've gotten better at measuring lightning in the field," said Ott. The observations spring out of field projects conducted in Germany, Colorado, Florida, Kansas, and Oklahoma between 1985 and 2002. For example, in a NASA field campaign called the Cirrus Regional Study of Tropical Anvils and Cirrus Layers Florida - Florida Area Cirrus Experiment (CRYSTAL-FACE) aircraft flew headlong through anvil-shaped thunderheads to measure the anatomy of the thunderstorms. Sensors sampled the pressure, humidity, temperature, wind, and the amount of trace gases such as NOx and ozone. Later, Ott input this data, as well as additional data from the U.S. National Lightning Detection Network and NASA's Total Ozone Mapping Spectrometer (TOMS), into a complex computer model that simulated the six storms and calculated the amount of NOx that the average flash of lightning produced. With that number, she could then estimate the amount of NOx that lightning produces globally each year. "One of the things we’re trying to understand is how much ozone changes caused by lightning affect radiative forcing, and how that might translate into climate impacts," said Pickering. There's a possibility that lightning could produce a feedback cycle that accelerates global warming. "If a warming globe creates more thunderstorms," Pickering noted, "that could lead to more NOx production, which leads to more ozone, more radiative forcing, and more warming," Pickering emphasizes that this is a theory, and while some global modeling studies suggest this is indeed the case, it has not yet been borne out by field observations. The new findings also have implications for regional air quality models. Scientists from the U.S. Environmental Protection Agency (EPA), for example, are already plugging the new numbers into a widely-used air quality model called the Community Multi-scale Air Quality Model. "Lightning is one of the smaller factors for surface ozone levels, but in some cases a surge of ozone formed from lightning NOx could be enough to put a community out of compliance with EPA air quality standards during certain times of the year," said Pickering. Pickering offered one important caveat to the findings: The value of 7 kilograms per flash was derived without consideration of lightning from storms in the tropics, where most of the Earth’s lightning occurs. Only very recently have data become available for tropical regions, he noted. Pickering emphasizes that this is a theory, and while some global modeling studies suggest this is indeed the case, it has not yet been borne out by field observations. Actually it's a hypothesis - theories _are_ borne out by field observations. The word theory has a different meaning to a scientist than to a layperson. Relativity is a theory. Careful with your terminology, people confuse these enough as it is!